If actions speak louder than words, then maybe action films are the masterpieces we need. Action films can inspire us to get moving and solve our problems—then save something. Why do we love watching people to impossible tasks when we relax? Today, most action films are blockbusters, high budget, and filled with big names. Technology has reached a point where we’ll never be able to reenact the stunts, car chases, and explosions we see on a regular basis, so we quote them, mimic smaller actions, and watch again and again. Here are 10 of the best action films from the past decade. Can you believe Iron Man came out 10 years ago? The prologue to the Marvel Universe, Iron Man shocked audiences with its sheer awesomeness and kick-started a franchise that would put out 20 action movies over the subsequent decade. Twelve films in the Marvel Cinematic Universe are still scheduled for release. Ant Man and the Wasp is the 20th film in the series, which averages one every six months. People love these movies for the action and the likable characters. Iron Man rebooted Robert Downey Jr.’s acting career and showcased an office-action heroine side of big star Gwyneth Paltrow in an explosive adventure fans continue to watch on cable TV before they head out to the bar on the weekend. “I will find you, I will kill you.” Liam Neeson was nominated for an Academy Award for Schindler’s List but at this point in his rich career, action movies are where we quote him most. Taken is the film that basically rebooted the “kidnapping movie” genre and gave plenty of Americans something to think about before traveling abroad. Grossing more than $226 million at the box office, Taken features interrogations, electrocution, and reminds viewers just how much one will do for their family. Winner of Best Picture at the Academy Awards, this film follows an American Explosive Ordinance Team in the Iraq War. Gritty and dark, it was filmed in the Middle East, adding to the realism of the film. As a character-driven film, Jeremy Renner diffuses bombs and also our hearts. With an awesome sniper sequence at the end, The Hurt Locker is a film that will keep you on the edge of your seat and, like most war films, near a box of tissues. The film’s director, Kathryn Bigelow, became the first woman to win the Academy Award for Best Director and became the first film directed by a woman to win Best Picture. With a cast like this, The Expendables is the ultimate homage to the action films of the 1980s and 1990s. Featuring the likes of Sylvester Stallone, Jet Li, Steve Austin, Bruce Willis, Arnold Schwarzenegger, Mickey Rourke, and more, this film was made for audiences young and old. Thought it was originally supposed to be a one-off flick, the film has inspired two sequels with a fourth film on the way. The fight sequences in 13 Assassins are amazing. Featuring an all-Japanese cast and script, the story follows 12 samurai and a hunter who are hired to take down a new leader. Before they get to him, they have to go through several hundred of his loyal soldiers. Martial arts films done well often remind us that action is art. 13 Assassins is no exception. Featuring sword fighting, hand to hand combat, explosives, puzzles, and more, 13 Assassins is chock full of the sheer awesomeness that keeps us coming back to action movies. Paul Walker’s swan song, this film embodies the franchise and leaves its gas pedal perpendicular to the ground. The film brings back the long, legendary cast, including Michelle Rodriguez, Dwayne Johnson, Vin Diesel, and Kurt Russell. The film features a tearful goodbye scene to Paul Walker, a proper tribute to the beloved action star. An impressive vehicle roster and action stunts that include a car dropped from a plane, a bus that goes off a cliff, and a heist prove that almost anything is possible with the right cars. The Fast films aren’t going anywhere and this movie symbolizes why. While Rocky VI kept audiences hungry for the eye of the tiger, Creed gave us our fill. Sylvester Stallone is back as Rocky, and he’s training his old frenemy’s son, Adonis, played by Michael B. Jordan. Rocky copes with aging as Adonis grapples with what it means to be Apollo Creed’s son. Emblematic of our time, Creed is a harrowing example of seeing a millennial struggle with identity and coming of age while a baby boomer struggles to pass the torch. The training sequences are there, the ring action is there, the soundtrack, the love story, and everything else audiences loved about the original Rocky shine in this tasteful reboot. Also, props to Sylvester Stallone to making it on this list twice. Would a list of top action movies be complete without Tom Cruise? In a nutshell, Edge of Tomorrow is Armageddon meets….Groundhog Day, of all concepts. Tom Cruise plays a new soldier that wakes up on the same day every time he dies. Soon, he learns the aliens that Earth is fighting against have the same ability. Day by day, Cruise learns more about combat, aliens, and himself in a concept that’s so wrong it’s right. 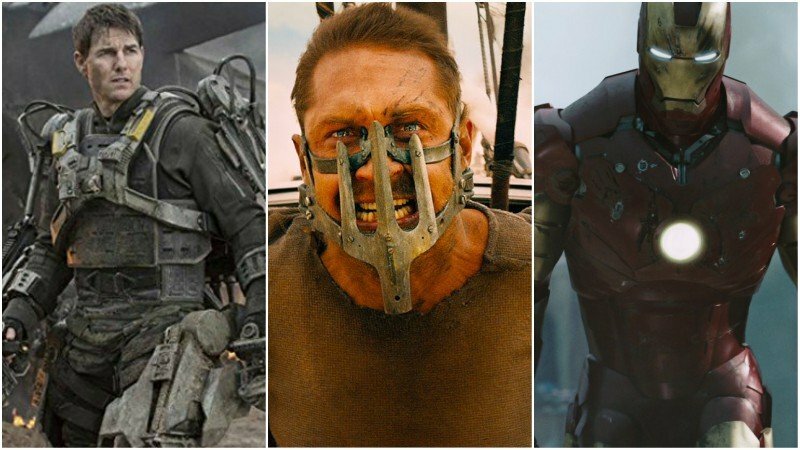 The only action movie that isn’t a reboot or part of a franchise on this list, a sequel is in the works, proving the film earned its stripes. It’s weird to look back and remember that The Dark Knight and Iron Man came out months apart from each other. Iron Man feels so recent, probably due to the continued storytelling of the Marvel Universe. Nolan’s trilogy, however, feels further back in time, perhaps because nothing could top this movie. Whether it be Nolan’s direction, the film’s revolutionary use of IMAX cameras, or Heath Ledger’s performance, anyone can be dazzled by it. The film inspired the “gritty reboot” movement in Hollywood, which hasn’t quite ended. New releases with an accompanying IMAX version are now uncommon. The film also has mythological clout in that Ledger’s performance was not only so iconic, it was his last. It’s rare for a sequel to be better than it’s predecessor, but Dark Knight reminds us that when it’s right, it is so right. When it comes to action films, audiences want everything. Tom Hardy and Charlize Theron are the only duo anyone ever would want to roll with when America becomes one giant desert. Mad Max: Fury Road not only serves everything, it does so flawlessly. Dystopia, a 45-minute car chase, battle, war, kidnapping, a heist, prisoner escape, eye-sore villains, betrayal, revenge, triumph; Fury Road leaves few boxes unchecked. One box that few films of its type can or even care to accomplish. While the film’s depiction of the future is grim, its quality is impeccable, technologically and socially. With the success of this film and also Black Panther, which deserves an honorable mention in the least, new possibilities for action movies open up. The post Top 10 Action Movies Of The Past Decade appeared first on ComingSoon.net.